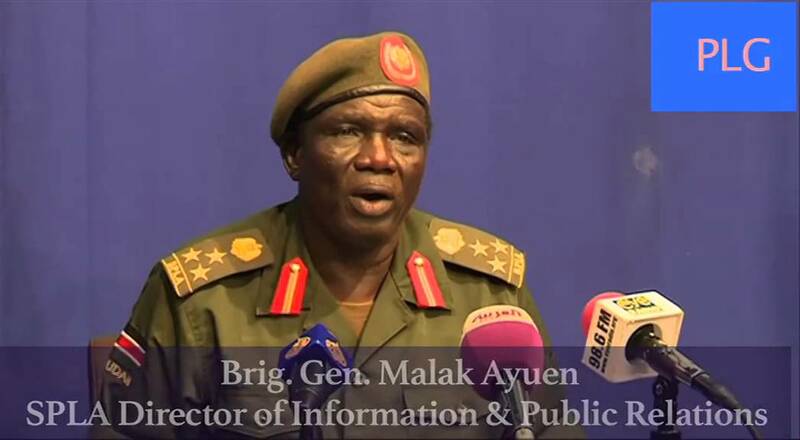 May 4, 2015 (Nyamilepedia)—am very disappointed seeing Brigadier General Malaak Ayuen Ajok threatening Nuer tribe to surrender their guns to the government. He thinks that this will help South Sudan to end this war that was imposed on Nuer people by the Government of South Sudan. When Gelweng moved against Nuer people this resulted in killing of more than 25000 in December 2013, in Juba alone. I am here telling the General that we are South Sudanese Citizens like other tribes. The deep hatred and fueling that he is preaching day and night on National Television, it is absolutely his choice and I think he is inviting more enemies and he will face it in the near future. Nuer men and women were in the bush starting from day one of our struggle not forgetting that good numbers were killed by Arabs as it was known. Second to that, we the Nuer people will appreciate if he can tell us that all Nuer soldiers who were killed during our struggle died because of sickness and not by war with Arab. It shown that Dinka people are only people that fought with Arabs. We are ready to hear it if that is true. In our history, Nuer man cannot be forced to put down his spears and the deep hatred of Nuer tribes that he is preaching on SSTV will keep Nuer strong. In fact he is strengthening Nuer by the way. He doesn’t want to show Nuer videos during our struggle because he hatred them. I think he is initiating a headache that will never get away. This shown that he is ignoring himself by insulting Nuer and other tribes. South Sudan will reunite in the near future. He will not run away as he may know that Nuer people are fighting with government because Nuer people were killed and others were burn alive, including children, women, pastors, and elderly in Juba by Gelweng that were trained privately by the President and his current Chief of General Staff Paul Malong Awan. Peace will come from government side not the rebels’ side. The President of South Sudan is the one who starting this war which was imposed on South Sudanese. Now the foreigners that he brought are enjoying because they are getting their wages daily while South Sudanese are suffering. East African people don’t want our country to be stable because we are getting our medicines, education, food and all things from their countries. This will ruin our beloved country because we are blind enough to know the truth. My advice to my dear, please change your words and let them become words of peace as I know that you will not finish Nuer even though you brought all foreign mercenaries who are looking for food. This will destroy our country forever if Salva Kiir doesn’t stop that war from now. Brigadier General Malaak Ayuen Ajok you are like other leaders that can become president of this country but because you put yourself down like a little child, you will not get any room and your enemies are increasing day by day. We will never and never surrender to genocidal regime that killed more than 25000 and still killing them like unwanted flies in the country that brought by all tribes. Bayak Chuol you are really pathetic man and diabolically person just keep singing song of Nuer had been massacres in Juba and what about 150000 Dinka you had massacres in Bentiu, Nasire, Malakal and Bor Riek Machar, James Koang Chuol and Peter Gatdet with his indiscipline militantmen so called wieves army should go to ICC to face crimine against humanity they have committed in those area. Ethnic regime is not any distinguishable from a tribal kingdom in which egotistically Brigadier General Malaak Ayuen Ajok himself personally feel obligated to play his part. This is the a pressure coming from those tribalist Jaang who see South Sudan from a tribal prospective. We already know it is a mentality that is destructive and will be chaotic imbued with anarchy should we South Sudan let these self serving clowns be allowed to continue imposing their will on the people. Sometimes when one is high with the idea of absolute power the danger lies in the possibility of losing touch with reality. The facts has it that the same power is subjected to a predictable end or a unfortunate sudden change. I am NOT well educated,but GatNor can not become president of South Sudan nor representing South Sudan in any country on earth with your High rank. I think you understand what i mean. If you are talking about the pic you are reading into things a little too much. That behavior is left for the ladies. Don’t turn a into a little b*tch on me now. You yourself will never amount to anything greater than that image leave alone the ranks it displays. Arabism,insulting is normal in Islam or in Islam insulting is normal thing. It seems you have no discipline and respect to people of South Sudan in large and particularly people of Nuer. Forget the entrenched hatred fed to the people by SSTV but our local communities are approaching peaceful co-existent from a small scale mutual understanding of neighborly communal. One of my earlier comment wish for this to happened and for each community to adopt the same as being done in Jonglei which will be easily monitor by the locals. The national politicians can learn from these local small communities and make peace amongst themselves as well. The government is the problem that is making these communities go to war with each other. Sorry,i meant that i am not well educated. What a noise from Nuer . You will not be in Juba military but peaceful or surrendered yourself like Lul Ruai. It’s my blive that S.Sudan will never experience logical peace till hatred imposed on Dinkas is lifted, bcoz the more you hate the more you yourself is hated by the one you hate.Nuers nd everyone shud understand tht the innocent pple who lost their lives in Juba where not killed by Dinkas but by government forces which comprise the whole tribes but the opposite is true,,,innocents Dinkas were killed by Riak nd his Nuers tribmen in the whole region of Upper ile. my massage to all South Sudanese is this, no any single tribes never take part in South Sudan struggle of (1983-2005 )it was no matter the hardship we pass through but we never give up, we were brothers and sisters of one nation and one God;but I wonder why our people shed their blood for no reason, let me tell you one things ladies and gentlements ,hatred, nepotism, trablesim ,racism and families lineage will never ever help us instead for us to join hands together and peace between us and forget the past at all, when say war Dinkas will not finished Nuer and even Nuer will not finished Dinkas,instead for both side to have peace and reconciliation, because of generation to come, my piece of advice as a local citizen is this let us forget the past moved forward for justice, peace and prosperity, bless to people of South Sudan, bless to nation at large. riak bullen akuany you are wrong all tribes participated the war of liberation. if you don’t history of our liberation don’t dare write about it. it’s started when we know it and its ended when we know it. Dinka did the heavy lifting. for your infromation, dinkas were killed by arabs including nuer, equatorians and even other dinkas (betrayers). tell me of any battalions or divisions that were formed by other tribes?. stop your nonsense! !